A previous weekend in Namhae convinced me that South Korean travel required a car, and we’ve finally returned over one year after getting my license in one day. It’s one last time in this beautiful place. Hardly anything can beat a cliff side pension with waves crashing against the rocks as our background noise. This weekend will be the quietest that we’ve had in a long time here. An early morning drive takes us towards Mt. Seolheul on the island’s southwestern edge and we pass Gacheon Daraengi Village’s main entrance for a pre-visit stop at a scenic overlook, starting our day with the first of many Namhae rice terraces. This travel guide is part of our series on South Korea Travel and East Asia Travel. It was originally created on August 8, 2015. It has been maintained and updated (as of December 28, 2018) to reflect current viewpoints and travel trends. I can’t describe as anything other than spectacular. Looking down into the perfectly organized and gorgeous Daraengi Village rice terraces, I’m happy that this will be the first part of our day. We drive down to the entrance and park in a spot that won’t draw too much attention. The day is off to a good start. We get out of the car and have a look around, already feeling welcome in Namhae’s Gacheon Daraengi Village that houses some of the most beautiful rice terraces I’ve ever seen. The morning is warming up and the scene reminds me of previous times here in Namhae. It’s about 9 a.m. and the sun is battling against the powerful morning mist in a moment that’s reminiscent of the fog that covered the iconic Geumsan and Boriam Buddhist Hermitage when we hiked it just last year. Today is a different story and thankfully the sun is winning, for now, setting up a wonderful light for early morning photographs. The terraces down below are a serene and picturesque mixture of green and brown with the blue-green sea sitting back as the perfect canvas. After a few minutes staring at the lovely panorama, we start walking and are thankful that the tour buses are somewhere else right now. For the most part, Daraengi is quiet and the shops seem to be just waking up from yesterday. This place proves my point that you should always arrive early if you want to avoid crowds. Some construction crews nearby are in the middle of a project that looks to expand and refurbish parts of the terraces. It’s a reminder that this is still an active rice farm that peacefully coexists with the tourist-hungry restaurants and cafes scattered throughout. Shops surround us with promises of ice cream, drip coffee or a meal. We store mental reminders for the post walk meal. It’s a struggle to contain our awe of the surroundings. Each turn around a corner presents a comparably better view than before, as the blues and greens intensify. The sun’s rising position helps but we’re approaching the time when it will be too high. Clouds have been very friendly lately and provide enough cover for blocking out the sun as it’s approaching 10 and 11:00. Along the way, a few photo zones appear and make me wonder why someone would need any nudge to get a shot of this spectacle. Just take the shot, I think. You shouldn’t need to be told where the best photo spots are. That’s half the fun but I keep that annoyance to myself, enjoying the minimal photo zone queues. There are just a few early morning visitors today but we’re not alone. We snap occasional photos for families and couples who are eager to capture the magic without a selfie stick. They return the favor and we go on our way, heading at our own pace towards the path’s end. The crowds are starting to come and we reach the end, feeling a bit hungry and in need of a bite. After a brief walk uphill and sitting down for a quick meal, it’s barely noon and this is the beginning of a long day. Waiting for our food with a group full of older men nearby, I can’t imagine a jollier scene. They’re getting loaded on soju and beer and trying to make the most of this day. I guess a tour group did sneak in after all, though not a big one. You can always tell by the matching nametags that accompany them. We pay and leave the restaurant. A short, uphill climb back to the car isn’t too bad for our marginally full bellies. Occasionally we stop and have a look down at the terraces and the water just beyond it. There’s something special about water no matter where I’m standing but this moment is especially nice. I really don’t want to leave this and feel like the incline is a sign. Honestly, I never want to leave places like this and would probably stay if there weren’t other things to do in Namhae. This is our final trip here and we’re making it count. After seeing a few more hotspots, I remember the end of our day and everything is wrapping up nicely. The sun is heading down to sleep for the day. We’re basking in the beautiful coastal road that sometimes veers inland and through villages scattered throughout the island. We don’t expect the scene that’s coming and are enjoying an alternate route back to the pension. It’s about 6 in the evening and sunset is still another hour away. Maybe 20 minutes away from our pension, the car comes out of a horse pin turn and down into the most beautiful terrace valley in Namhae. There are neither signs nor any indication that these have a special designation or story like Daraengi but this simple collection of terraces is more deserving than our morning’s first stop. I can understand why because honestly there’s nowhere to stop without putting one’s life on the line. For the moment, there no cars are around and we can drive slowly through, allowing Christina to capture the scene. One shot sticks out and perfectly captures the sun in the background. The light bounces off and bringing enough light to create a wonderful scene that we discovered. Beautiful green and brown with blue skies all around are the perfect way to describe this day. I’m so happy that it’s there forever. As if the perfect day wasn’t already fulfilling enough. I can’t stop looking back to that last moment with the descending sun and unheralded terraces. We spend another quiet night playing cards and even the next day during our drive home, I try to properly put that memory in a safe spot without any hindrance or lessening of those beautiful colors and rays of light. 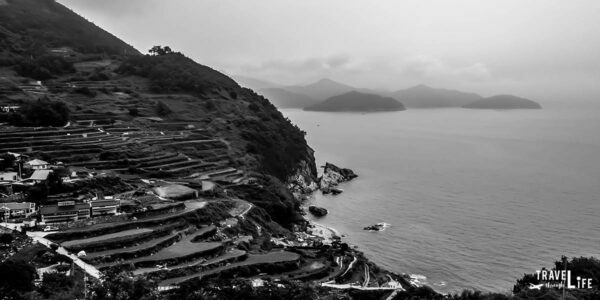 There’s always been a special memory that comes from a visit to Namhae and that final set of terraces will win this time. I’m going to miss Namhae for a lot of reasons. However, that moment with those wonderful rice terraces was the best way to close it out. Namhae Rice Terraces fantastically started our day but also perfectly surprised us at the end. 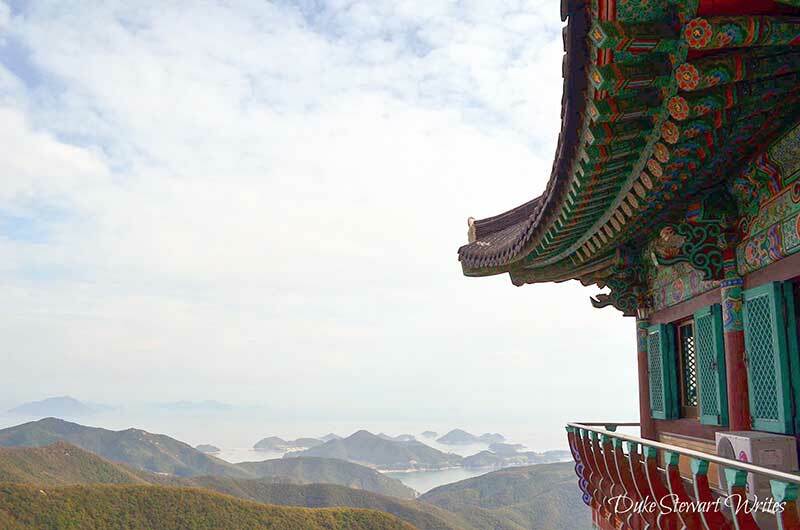 Have you ever visited Namhae? Got a similar moment you’d like to share? Leave a comment below! I love the way you put together the photos. It really brings out the best of this wonderful place. Great read, too. I spent a month in South Korea but I’ve always been super bummed I never made it to here! Wow, that lighting is just surreal. So sorry you couldn’t make it to Namhae, Stephanie! You would love it, I’m sure. Maybe next time? 🙂 Let me know if you do and I can help you out with some tips on things to see and places to go! Thanks for commenting. There’s definitely a mesmerizing quality to the rice terraces. How beauty can result from human toil makes it all the more affecting because what man generally imposes on the Earth in the name of industry tends not to beautify it. You’re so right, Jeri. I think a big part of this place and others that stick out to me is that they’re not just created for the aesthetics but for function above all. The beauty is only a result, like you say, and that’s what makes it that much more memorable. Namhae and the terraces are some of my favorite places in South Korea. The beach area is great for an early fall retreat and walking along the terraces out to the ocean is nothing short of magical. You’ve probably been to Namhae quite a few times, Steve. I’d love to chat it up with you about that place in the future. This was our first (and unfortunately last) time to Namhae with a car so the Rice Terraces had always been too elusive for a visit. Sangju was always my favorite beach. Did you have any others in mind worth sharing? Thanks for commenting, Steve. I hope you have a wonderful weekend! Lovely article and beautiful photos. Would you mind sharing the name of the pension you stayed in or site to find one in that area?I’m in Korea and Namhae is on my list of places to visit. Thanks in advance. Hey there Angie! I’d love to share the pension with you. It’s called Namhae Evergreen and though it overlooked some wonderful cliffs, I will warn you that there was a bit of power line obstruction. Didn’t really ruin it for me but just thought I’d let you know. We were referred to this place by other expats and have to say, the rooms were really comfortable. They’re a bit off the beaten path though so I hope you’ve got a car to get there. Here’s the link to their site. If you plan on booking, try and have a Korean friend/coworker call them. The owners are really nice and even spent quite a bit of time in the U.S. but are afraid of making a mistake, and will prefer confirming everything in Korean. I hope that helps you and that Namahe is as magical for you as it is for me and my wife!